Welcome to Tuesday's Truths week three. 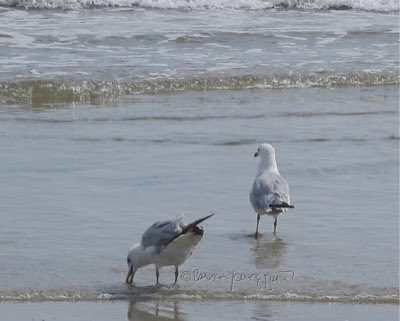 If you follow this blog, you may recall on the second week of my series, Tuesday's Truths, I blogged about certain truisms re the bird type known an an American Oystercatcher, a bird type I was "introduced" to during my recent trip to Long Beach New York. 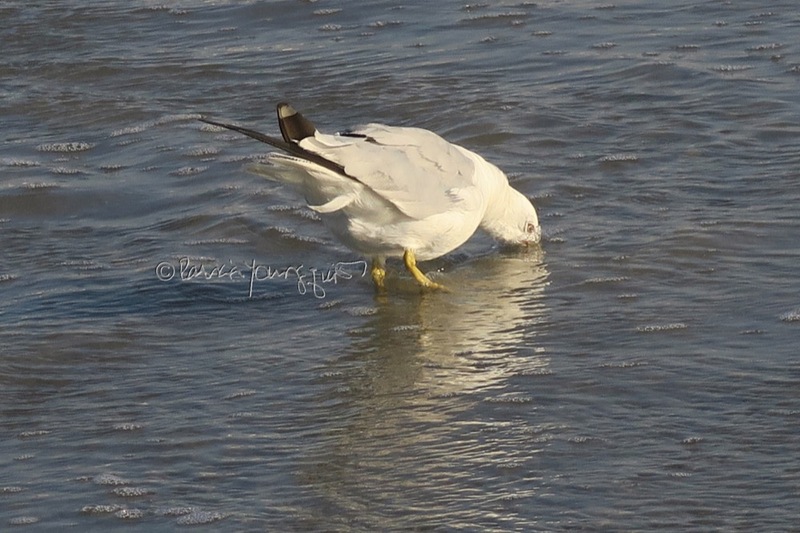 A member of this bird variety can be seen in the lower lefthand corner within the image posted above, where he/she appears to be taking a drink from the salty waters of the Atlantic. 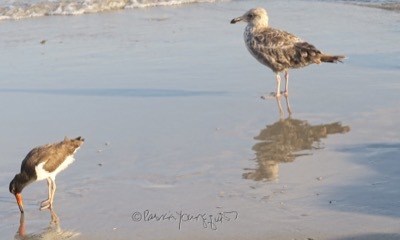 The bird featured in the righthand side of the picture is a juvenile seagull. This bird variety can drink both fresh and salt water. "Most animals are unable to do this, but seagulls have a special pair of glands right above their eyes which is specifically designed to flush the salt from their systems through openings in the bill." My source for this truism can be found by clicking here. 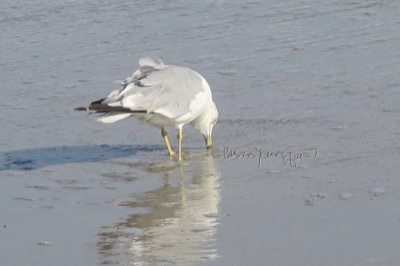 And you may recall, dear reader that I posted information re the seagull-bird-type-drinking-saltwater-phenomenhon in 2013. 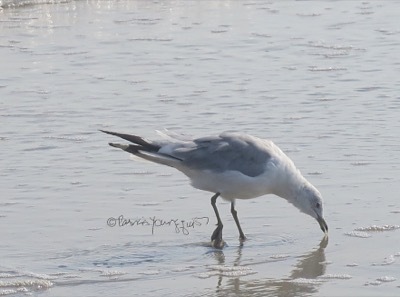 In any event, during my recent trip to Long Beach, I found myself still being fascinated by the seagulls' "habit" of drinking the salty waters of the Atlantic. "Gulls, and many other charadriiform birds, have supraorbital glands (also called nasal or salt glands) that help regulate the ionic balance of their blood, according to Britannica Online. While some salt is processed by the kidneys, the excess runs through the glands, which are positioned in grooves of the skull, and trickles out through the nostrils. Other animals also have salt glands, including sea turtles, crocodiles (crocodile tears) and sharks." My source for this truism can be found by clicking here and I've included a few more of my photo-ops (below) of seagulls drinking saltwater. Btw, the aforementioned source re this truism pertaining to seagulls, refers to another truism about them and states "those birds (seagulls) are adept at stealing your sandwich or even invading your hotel room through an open balcony." I have never stayed at a hotel on the shoreline so I have not had the experience of a seagull invading a room at such a place, but I have been both a witness and a victim of this bird-type's robbery attempts. A number of years ago when I was with a dear friend, VB, at Long Beach, we took a walk along the water so that the Atlantic waters could refresh our feet from the summer heat. VB is an extremely shy soul and to get him to remove his shoes for taking our walk had not been easy. 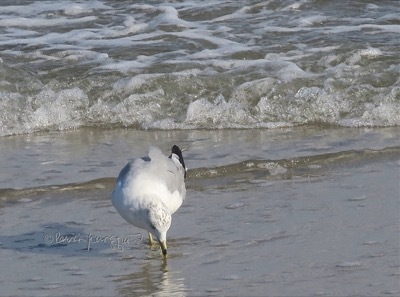 As we made our way west along the shore, I glanced back to check on our belongings and saw seagulls carrying his shoes away from our beach blanket and into the air! Fortunately VB was able to chase after the seagulls and they dropped his shoes on the sand and not in the ocean! The friend I am referring to is currently recuperating from a mysterious illness that he succumbed to in 2014; and I had made plans to visit him after my most recent visit to Long Beach. He had requested that I bring him a small bottle of Holy Water which I had agreed to do, and had tucked it into my beach bag. I left the beach bag containing his bottle of Holy Water as well as some of my apparel on a towel in order to have my hands free to photograph the shorebirds. 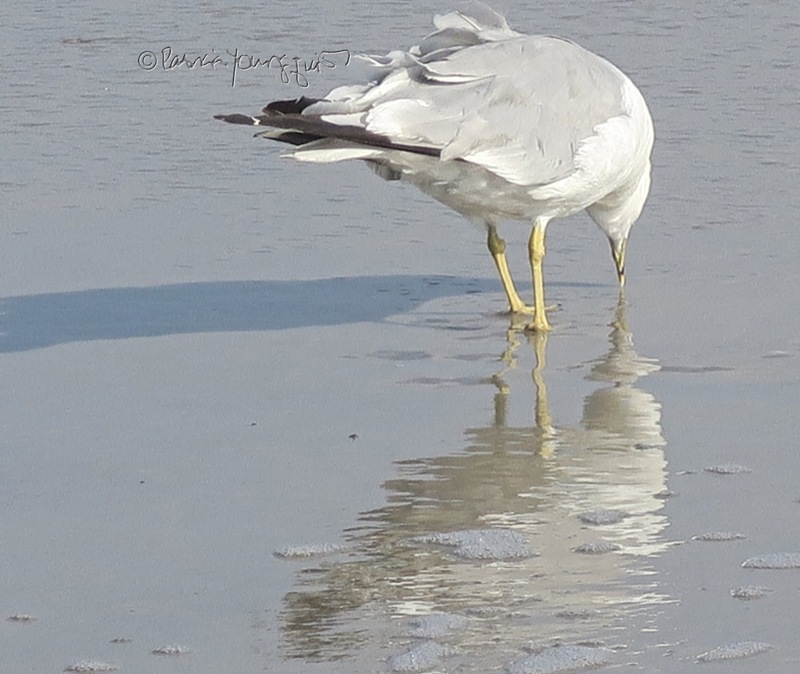 I was so involved with taking their images while they were in the ocean, that I had not noticed that other birds of the same species opened my bag on the beach! They were tossing everything out of it, including the bottle of Holy Water that was intended for VB! Therefore I concluded that while seagulls enjoy both salt and non-salt water, they seem to have no use for Holy Water. I guess they aren't Catholics?